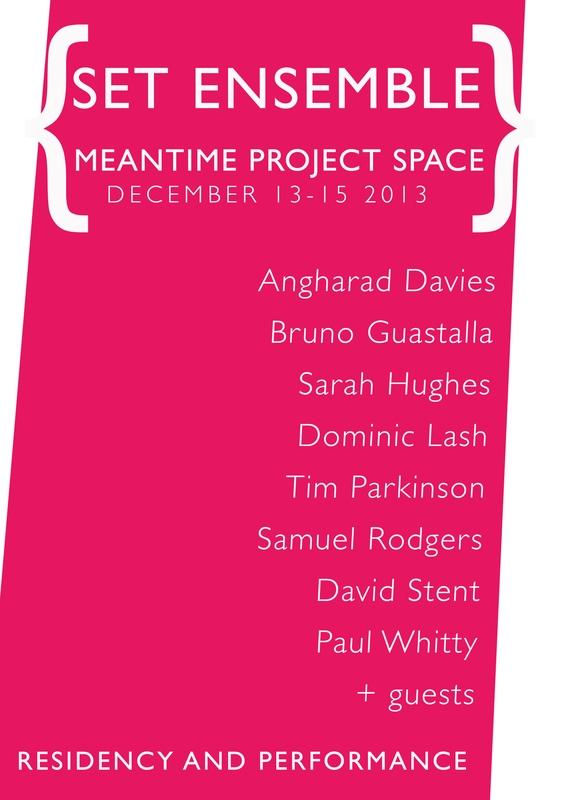 SET ENSEMBLE RESIDENCY, MEANTIME PROJECT SPACE, CHELTENHAM 13/14/15 DECEMBER | who's that knocking...? During their long weekend at MEANTIME, the Set Ensemble plan to try out new approaches to their work, and to rehearse, record and perform. All are very welcome to observe open rehearsals and a public performance. Founded in May 2010, the Set Ensemble is dedicated to experimental music and contemporary composition. The ensemble has a particular focus on the work of the Wandelweiser group, which is an international composers collective devoted to furthering the investigations of John Cage into the role of silence in music. The Set Ensemble have performed music by composers including Antoine Beuger, George Brecht, Jürg Frey, Eva-Maria Houben, Radu Malfatti, Ben Patterson, Michael Pisaro, James Saunders, Stefan Thut and Manfred Werder. A more recent development is for members of the group themselves to write compositions for the ensemble, as seen for example in recent recording to be released on the Consumer Waste label in 2014. The Set Ensemble performs in shifting configurations depending on the circumstances; versions of the ensemble have performed in London, Oxford, Sheffield, Glasgow and New York. The Set Ensemble comprises of Angharad Davies, a violinist; Bruno Guastalla, a musician, violin maker and restorer; Dominic Lash, a freely improvising double bassist; Samuel Rodgers, a musician and sound artist; David Stent an artist, writer and musician; Paul Whitty, a composer and sound artist; Sarah Hughes, an artist and musician; Tim Parkinson, a composer and pianist; and James Saunders, a composer with an interest in modularity.